Live voice and video chat are a channel for website visitors to reach out for immediate help. However, the persistent challenge is that the “agent” must constantly keep guessing to understand the visitor’s issue. Co-browsing solutions come to the rescue to resolve the issue efficiently. Co-browsing is the term used for “collective navigation of different sections/pages of the website” in addition to live chat and video chat. This drastically reduces lengthy explanations by the visitor/prospect/customer to the support agent. Imagine you are facing an issue with your laptop, but your company’s technical team is in another country. Wouldn’t it be really hard to explain the situation over skype, or maybe via mail? Misinterpretation of context will lead to time loss, frustration, ill-feelings between co-workers – essentially missing each pillar of value your company is trying to strive for. That’s where Co browsing helps, which is fundamentally a process where the agent views the same set of pages which the prospect is viewing. With co browsing websites, live chat and video chat, support agents can provide real-time personalized guidance thus saving on the time spent in understanding the issue. While navigating a website, a visitor may face an issue, or he/she may not know which button to click or there may be some other glitch. At this time, when he reaches out for help via live chat and video chat, the agent asks to share the screen via an online tool, called as a co-browsing tool, which need not be installed on the visitor’s system. Once the visitor gives permission, the helper can co-browse the website with the visitor and see exactly what the visitor is seeing and doing. This immensely helps the support agent to effectively guide the visitor more effectively. Business dynamics have changed to an extent that time and speed have gained more business value than money and staying consistent is the icing that everyone is on the lookout for. Provide remote support from the browser: there is no need to install additional software to provide support which makes the customer feel safe about his data privacy. Customer satisfaction: prompt resolutions without the hassle of multiple screenshots and lengthy explanatory emails enhance customer experience thereby increasing retention rates. High conversions: this is a factor that helps determine the level of trustworthiness a customer will have on the company’s product and/or services. Prompt resolutions to queries/issues is the key, which is more effectively possible via co-browsing. After all, customers still prefer a human working with them real time, doesn’t necessarily have to be in person. Beyond chat: live chat and video chat have their limitations in which customers must give lengthy explanations. Co-browsing solutions saves time for both and helps provide a quick and efficient resolution. Enhanced buyer experience: as per research conducted by Forester, real time support including co-browsing websites have immensely helped customer satisfaction compared to any other support option. 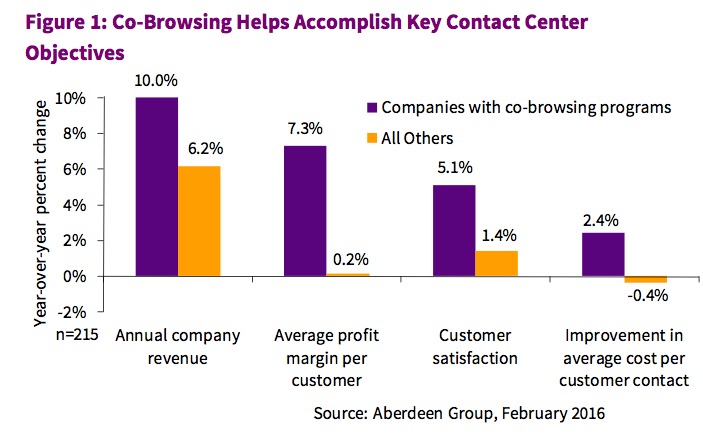 The below figure, sourced from the Aberdeen Group from February 2016, gives a visual representation of how co-browsing has helped to increase some of the critical contact center metrics. Co-browsing solutions are increasingly coming to the rescue in various online applications. Some of these are described below. Internet banking has evolved by leaps and bounds in the last decade. Users have been provided with more options in terms of functionality. Although the core platform is the same, implementation varies from bank to bank. Users often need help to navigate through the various options immediately. Live chat and live video have their limitations. Screenshots do not help as they give only a part of the whole picture and require the user to login multiple times as per the “disconnected instructions” provided in the email. Co-browsing tools come to the rescue as the helper co-browses the same page with the user and provides instant guidance. This saves time and provides an instant resolution with enhanced customer experience. Conventional learning methods had limitations in terms of volumes of books to be read and researched for a given topic. This was cascaded to the e-books and online content which was further augmented by the unguided audio-visual courses available. Although the deliverable was clear, the effectiveness of the deliverable was not. With the evolution in the methods of e-learning, co-browsing tools facilitate the process of guided e-learning. This helps to bridge the gap between the trainer and the trainee in terms of the knowledge delivery and understanding. Co-browsing websites and co-browsing tools have immensely bridged this gap between the trainer and trainee in terms of the effectiveness of the training session. It has made it more interactive with a higher probability of retention in the trainee’s mind. E-Commerce websites or the online shopping malls are the most complex web applications developed considering the factors involved. These require more stress on the efficiency of support options besides live chat and video chat. Support agents cannot afford to spend too much time to understand the issue, the focus should be on the promptness of the solution provided without sacrificing customer experience. The support agent can quickly guide the customer as he/she is browsing in the same secure login session. Quickly guide the customer to find the product with related info such as reviews, specifications, features, benefits, comparisons, etc. This saves time for both – the customer and the agent. Complex websites with complex functionality need support options beyond live chat and video chat. Co-browsing solutions without compromising on security, address these issues. Co-browsing can leverage the support options for the customer browsing experience with the assurance that the customer’s data is not compromised at any point. These helps to leverage customer retention by empowering the customer support team with the necessary means to resolve issues more efficiently thus adding to company revenues in multiple ways – saving time and resources to respond to a query and ensuring completion of a sale with possible up selling.